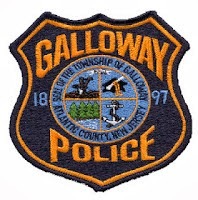 On January 13, 2014 Galloway Township Police responded to a motor vehicle accident on Race Track Road and Aloe Street. A 2012 Chrysler 200 driven by Josephine Demarco was traveling north on Racetrack Road and collided with a 2005 Chrysler Crossover, which was traveling east on Aloe Street and ran the stop sign on Aloe Street. The driver and passenger of the Chrysler 200 sustained moderate injuries. They were transported to Atlantic City Medical Center Mainland Division and Atlantic City Medical Center City Division.